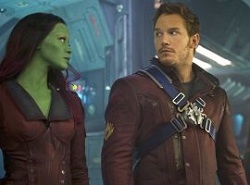 Guardians of the Galaxy opened as the highest- ever grossing film in August, and has continued to top the charts at the box office. It is a thrill ride that families, particularly those with teens and young adults, are sure to enjoy. 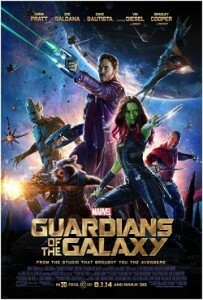 The 10th installment in the Marvel Cinematic Universe, Guardians of the Galaxy features a team of superheroes with Chris Pratt (LEGO Movie and Parks and Recreation) as Peter Quinn/StarLord, Zoe Saldana as an alien assassin, Bradley Cooper as the voice of Rocket, a fast talking raccoon, and Groot, his talking-tree side kick. This band of multicolored misfits haphazardly teams up to save a distant planet from Ronan the Accuser, who plans to destroy planets and control the galaxy with the coveted Infinity Stone. Peter Quinn, a rogue space pirate, steals the orb which secretly contains the Infinity Stone. All the action is set to a soundtrack of classic 70s music. Peter Quinn holds preciously onto a cassette of 70s music that his mother made for him before he was abducted from Earth in 1988. The music adds a note of goofy nostalgia, keeping the film fresh and grounded. Starting out as independent and selfish individuals, Peter Quinn and the other Guardians, learn to sacrifice themselves for the others. In the course of the story, each character pursues the Infinity Stone for his own selfish reasons. By teaming up, the Guardians, not only discover there is more to life than self-interest, but that they are not alone in their problems, a valuable message for any teen and adult alike. Using the uniqueness of each, they overcome Ronan and save the galaxy. The film’s eclectic visuals and sound blend to serve the film and reflect the misfits coming together. This is a fun action film grounded in a strong story and characters with visual effects that are just icing on the cake. 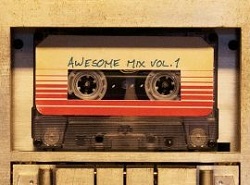 Families who enjoy comic books, 70’s music, and an unconventional hero will surely enjoy this film. Heads up to families with young children: the movie contains comic book violence and some crude and sexually themed language and humor. This film would be best for teens and up. This post is co-authored with James Zambrana.